Do Tools Matter When Making Historic Book Structures? I made this reproduction 18th century French wooden straightedge. Does using it to make a historic bookbinding model *really* affect the process or outcome? Am I heading down the road of wearing a faux French craftsman costume while I do this? Skillful use of hand tools often depends on their embodiment. They literally become become extensions of our consciousness and body. We think through them in use, not about them. Don Idhe’s example of driving a car is useful. We don’t have to pay conscious attention to where we are on the road. We just drive. The car is a complex tool that has become embodied. We constantly unconsciously adjust to keeping it on the road. In bookbinding, paring leather is a similar unconscious complex activity. If you are interested in this kind of thing, Don Idhe’s Technology and The Lifeworld is a exceedingly readable philosophy of technology. All craft activities have a greater or lesser degree of embodiment, it accounts for some of their joy, relaxation and pleasure. We get out of ourselves for a while. People often remark on how a tool fits their hand, or is an extension of it, and that it disappears in use. And how time quickly disappears when engaged by using it. In teaching historic bookbinding structures, however, that these ingrained habits can be counterproductive when trying to recreate, or at least understand in detail, the nuances of earlier techniques. This is one reason for using historic and reproduction tools. They can help take us out of the familiar, and challange our ingrained craft skills. They force us to rethink our relationship to a particular tool, and by extension our relationship with the object being crafted. It is all too easy to slip into 21st century work habits when trying to construct a 16th century Gothic binding. Using historic tools may or may not be the easiest way to do a particular task. When conserving a book there are many other considerations, including the safety of the original artifact, so many historic tools and techniques are not appropriate. And of course, the skill, experience and ability of the conservator is a significant factor. But by in large, the traditional tools of hand bookbinding have not been mechanized because they are an efficient and accurate way of working. Possibly the most important aspect of using historic tools, or reproductions, is they aid in interpreting historic techniques. 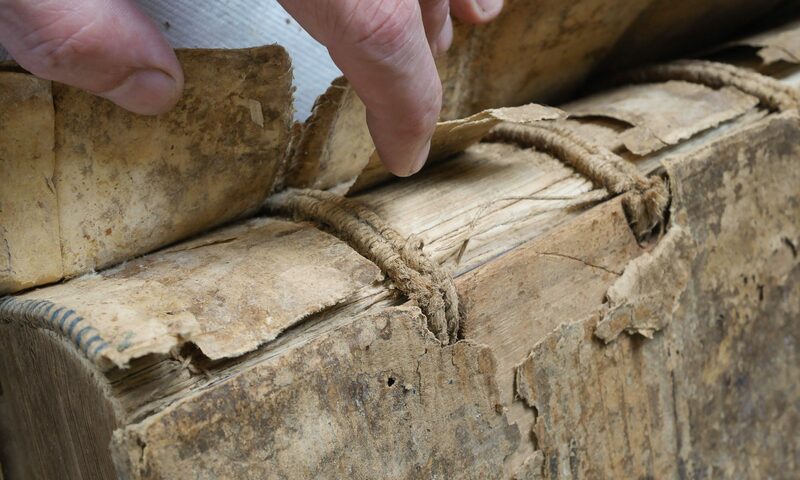 Binding a book in an historic style, even inexpertly, helps us understand deeply how older books were made. And isn’t this type of knowledge at the core of any book conservation treatment? I enjoyed it very much. I always say that being skillful means choosing the right tool for each task, not trying to do the impossible with an inadequate tool. Very true, It is painful to watch someone struggle with a dull knife, for example. Both dangerous to the user and the damaging to the craft object!